After retiring for the second time from teaching math at Menlo-Atherton High School, Margo McAuliffe found herself a bit adrift, unclear what she was going to do next. While she’d volunteered for a number of organizations, “nothing was really speaking to me,” she recalls. A Saturday afternoon spent in silence with friends making a collage showed her a new path. A friend put Margo in touch with a Kenyan Roman Catholic priest, Fr. Daniel Kiriti, and after some fits and starts, she found herself landing in Naroibi. “That was in 2005, and the start of a really wonderful friendship,” she says. It was also the seeds of Kenya Help, a non-profit Margo founded that provides resources and support for the benefit of women, children and youth through education and training in the communities of Naivasha District of Kenya. Early on, she observed that there were enough math teachers, and if she was to teach, she’d be taking a job away from villagers. So, while she does do some teaching alongside village teachers, she’s focused on raising funds for village needs. 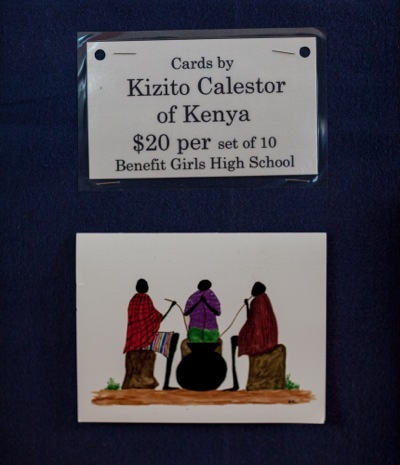 Over $1.3 million has made its way to Kenya since that first trip, with a donation of $700 sponsoring a student for a year. She’s found that’s an amount that many residents of Menlo Park – where she’s lived since 1970 – can afford. In addition to ongoing student support, Margo is setting her sights on raising enough money to buy a grinder to augment the dough maker and ovens already in place. She’d also like to buy a bus, which would take the children on their annual outing and could be rented to other organizations working in the area. More information about getting involved with Kenya Help is available online.